No one likes criticism, but there’s a right and a wrong way to provide constructive design critique that could mean the difference between a “meh” final product and a reputation as an organization designers don’t want to work with and a “wow!” final product and a strong relationship with your designer. It’s embarrassing to admit, but awhile back I had a call with a client to review a near-final version of a report. It was all going well until they off-handedly mentioned that they felt the cover I’d designed (which they’d seen before and ok’d) was “horrible” and “outdated”, and they didn’t like the colors. Ouch. Talk about painful. Now, I’m a professional. I try not to let design critiques get under my skin, or take them personally. However, when feedback is phrased like this it’s hard not to bristle and get defensive – I pride myself on providing great design solutions for my clients! My other clients like my work! Of course, as a client it’s your design and you need to be happy with it. But there’s a way to deliver your critique that will have your designer happily going back to the drawing board for you, rather than grudgingly making changes they don’t understand and that don’t match the overall vision of the project. Recognize that design 99% about communication: If I’m designing for myself I hit the mark 100% of the time – but that’s only because I know exactly what’s in my own head. When I’m designing for clients there’s always an element of guesswork. The best that I can do is interpret the brief I’m given to the best of my ability (hence the reason I ask so many questions up front.) If you’ve received a piece of design you aren’t happy with, think about where the communication might have broken down, and reach out to try and correct any assumptions the designer might have made incorrectly. Make your critique as specific as possible: It’s MUCH easier to fix something like “the colors you’ve used here aren’t as vibrant as I would like them to be,” rather than a general “I don’t like the look” or “it just doesn’t pop”. Be as specific as possible with your feedback and you’ll get a good result. 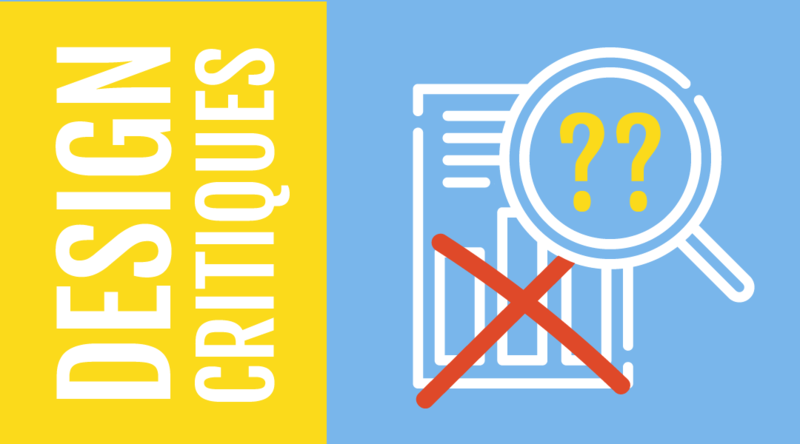 Critique early in the process: Once you’ve seen a cover design or a graphic in a couple of different drafts of a document, the designer will likely assume that the design is good to go. If later on you decide you’re not happy there may not be enough time to fix it, or making significant changes may have a knock-on effect to other elements of the design. Many designers limit the number of rounds of revisions they will do within their quote, which makes it extra important to include all the reviewers on your first round if possible so you don’t wind up incurring extra costs. There’s no use in everyone happily signing off only to have a senior staffer throw their “I don’t like it” spanner in the works at the 11th hour. Deliver your critique face-to-face where possible: I know it’s not always easy to fit in another call or meeting into the schedule, but it makes delivering a design critique much more productive than just throwing it into an email. It allows you to explain why you’re feeling the way you do about the problematic part of the design, and open up the conversation for how you can fix it together, rather than just dumping it on the designer’s plate and throwing your hands up. A quick Skype or Zoom call works as well as a more lengthy review meeting. It’s not always comfortable, but it’s worth it. Give them an opportunity to fix it: Don’t stew behind the scenes or ask another designer to “take a stab at it.” Trust that you hired your designer for a reason, and let them take a second crack at getting it right. If you’ve hired someone good then the problem is more than likely to be a misunderstanding of what you were looking for, rather than just bad design skills or style. Communicate any changes in your branding early and often! : Refreshing your brand colors? Deciding to use a different display font? Make sure to let your designer know as soon as you can. If you’re not on the Comms team and aren’t fully up-to-speed on all the latest changes, it’s good practice to make sure that anyone you have working on projects is connected with someone in that department early on. That quick introduction can save a lot of pain. The next time you’re faced with a cover design that’s not knocking your socks off or an infographic that feels less than original, try to run through these points and see if you can’t think about how you provide your feedback in a different way. If you take even a few of these tips into consideration, you’ll be sure that you’re giving a constructive design critique and feedback that will have your designer singing your praises, and an end product that everyone is proud of!